Enrollment Requirements: Your puppy must be on an age appropriate vaccination protocol in cooperation with your veterinarian. Please bring a statement from your Veterinarian to the first class indicating your puppy is on a protocol. The brain of a puppy is fully developed at seven weeks of age. Pups are capable of learning, but must be handled carefully and instructed properly. Puppy Kindergarten is the answer to teaching your puppy correctly from the beginning. Classes are designed for the very young puppy and are taught by Jan Bramhall, with other experienced instructors and assistants. Puppy kindergarten will help you to successfully socialize, raise, and train your new Golden Retriever puppy. Give advice on correct socialization and training techniques. Offer help with puppy behavioral problems. Let you know about spaying, neutering, breeding, showing, etc. Describe grooming, health care, safety, microchipping/tattooing, etc. Explain how to communicate effectively with your puppy. Notify you about the Golden breed in general, clubs, events, etc. Show you how to teach your pup to be a retriever. All this and more! This is a unique opportunity for you and your puppy to meet, train, and interact with other puppies and their owners, under supervision of experienced and knowledgeable Yankee Golden Retriever Club members. 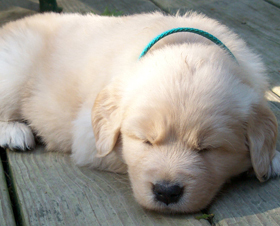 Golden Retriever puppies have preference, but other breeds are accepted if there is space in the class. Yankee also offers a Post-Grad class for puppies and older dogs who have completed this or another puppy kindergarten or who already know the basics of a kindergarten training class. This course continues the "manners and citizenship" education begun in Puppy Kindergarten. Golden Retrievers have preference, but other breeds are accepted on a space-available basis. These classes also are taught by Jan Bramhall, with experienced club member trainers assisting. The focus of the classes is the AKC Canine Good Citizen exercises, and the CGC test may be administered at the final class. The training program is geared to individual dog-handler teams, and each enrollee can progress at his/her own rate. Discussion, demonstration, and a simple introduction to agility and competitive obedience equipment is also included at the discretion of the teaching staff. The first class is a lecture/demonstration. Do not bring your puppy. Notebook and pen will be helpful. You need a buckle collar—3/8"-5/8" wide—leather or nylon webbing. The leash must be 6' in length—3/8" to 5/8" wide— with small snap—either leather or nylon/cotton webbing. Please do not use a retractable leash or choke collar. Dogs must be exercised in the grassy area across the driveway from the training center. You must clean up after your puppy, both inside and outside. Supplies are provided. The floor is covered with rubber matting to prevent slipping, but low heeled shoes are a necessity. Because you will be working with a small puppy, you will find yourself on or close to the floor a good part of the time. Washable, casual clothing is recommended. We encourage all family members to attend. Your family and puppy will benefit if all receive the same information and training instructions. Children who want to come are welcome, and are often the best trainers, but please don't make children come. If your puppy is not feeling up to par on class night, please leave him or her at home, but you should attend to keep up with class material. If the weather is bad, training classes will not be held. If you are unsure, call 774-249-1956 after 4:00PM on class day for information. A makeup class will be scheduled.